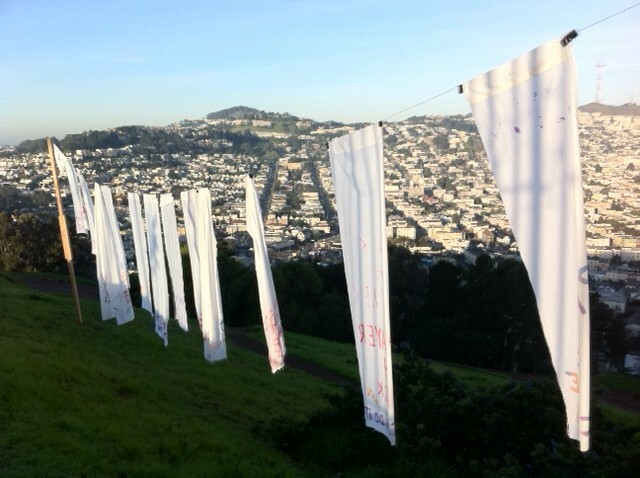 What’s Going on with All That Laundry Somebody Installed on Bernal Hill? I think it has something to do with Egypt. Bernalwood has more pics and a little bit of explanation. Author Allan HoughPosted on February 4, 2011 Categories Media and Politics1 Comment on What’s Going on with All That Laundry Somebody Installed on Bernal Hill? ‘World-Class’ Cesar Chavez Improvements Are A Go! 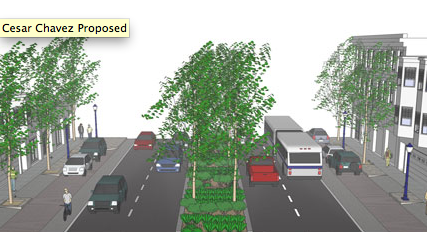 A long-awaited blueprint to significantly improve safety and livability conditions on Cesar Chavez Street was approved by SFMTA Board today, culminating nearly a decade of community input and planning. I can’t wait! Read on. Author Allan HoughPosted on February 2, 2011 February 2, 2011 Categories Cycling, Media and Politics40 Comments on ‘World-Class’ Cesar Chavez Improvements Are A Go! 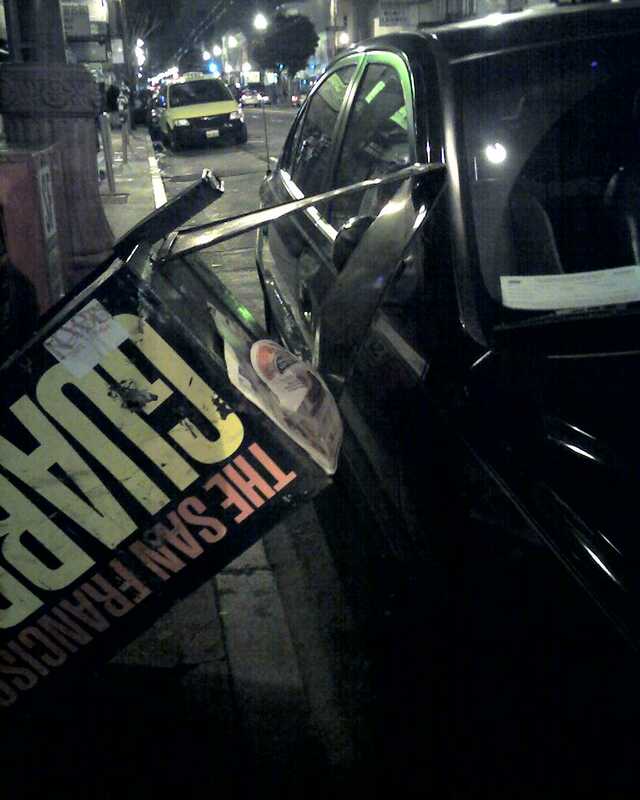 Okay, maybe not “wrecks.” But there had to be some damage. Shame on you, SF Bay Guardian. Will Ritual Roasters Get a Permanent Parklet or Not? We mentioned the possibility last month. Neighbors’ main complaint is the loss of parking spaces. The project outside Ritual Roasters, for example, would take up two spaces on the street. Other people, however, worried that the seating areas would attract homeless people and drug use after business hours, and others were concerned that the areas are too close to traffic. Laura Marcic, who lives next to Ritual Coffee Roasters, said she worries that the increased seating area will attract a crowd after hours, which will lead to more noise and trash. 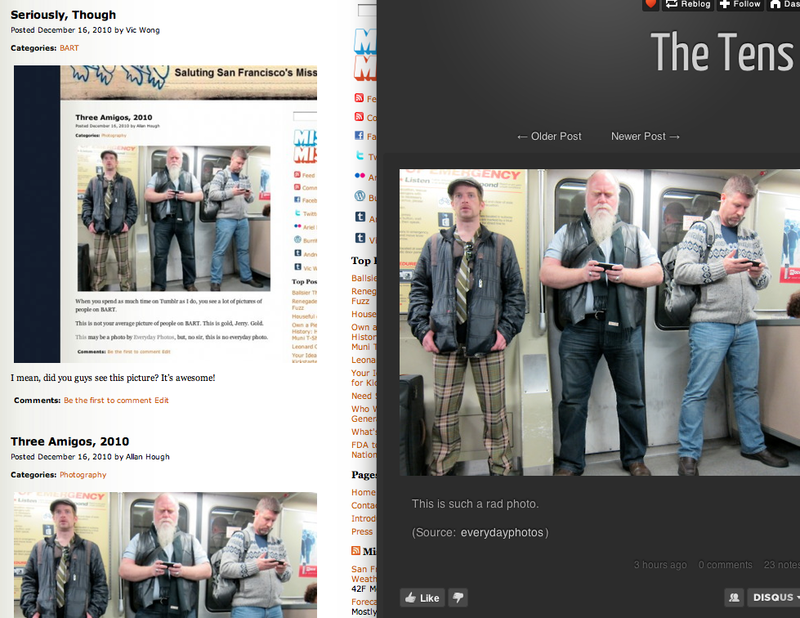 Author Allan HoughPosted on December 21, 2010 Categories Media and Politics24 Comments on Will Ritual Roasters Get a Permanent Parklet or Not? For a very special Christmas episode of Necessary Conversation, the gals go inside the City Hall Holiday Open House. They get a sound-byte from Frank Chu, they meet the Supervisors, and they exchange some dirty innuendos with Gavin Newsom. See for yourself. Merry Christmas! Coming back from visiting some family for the holiday weekend, I came upon the new option of either going through TSA’s full body scanner or “opting out” and getting the full feel up. Going out of SFO there was nothing like that, but coming back from the San Diego airport they gave us the reach around, I mean run around, I mean full monty, I mean full treatment, I mean . . . no, that is what I mean. Anyway, I opted out, along with the two female passengers I was traveling with. I’ve read a little bit on the health concerns and remain convinced that there are dozens of things I should be addressing about what we’re exposed to daily before I worry about a few seconds of this level of radiation. I opted out because I don’t think it should be easy to push us into new areas of decreased options without some push back. Not intended to slow down progress, but to put pressure on the deciding bodies to check their intentions. Blah blah. So I got the pat down. Actually, it seemed quite like the body searches I’ve had plenty of times while being picked out of the line to be touched all over. Seeing the Giants temporary tattoo on my forearm the TSA Toucher got me comfortable by talking about baseball. Despite being a Red Sox fan, he was a very pleasant fellow. He didn’t give me grief or even ask me why I was choosing to opt out of the scan. I asked him if the opting-out had created bottle necks in the process and he said that he usually worked at a terminal that didn’t have body scans and people would walk up to him exclaiming “I want to opt out!” and he would just sigh and tell them to go on through. He started off by telling me that he wouldn’t do anything to me that would require him to buy me a drink. First he patted me down and when he got to the bottom of my happy trail area he quickly brushed across to my inner thighs with the back of his hands, making no moves to grab or fondle anything he may have found. A couple leg pats and that was that. Residue tests came back negative and I was on my way. Not so bad, but also not so great. Safety first, for sure, but with complications like privacy issues and racial profiling, this whole business becomes quite tricky. Then we had some free time and since the TSA guy hadn’t bought me a drink I got the round and we did some airport karaoke.